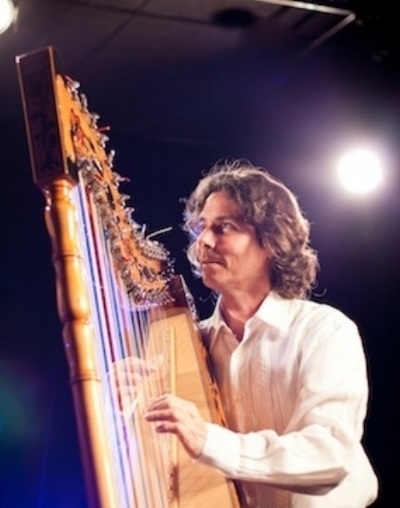 Nicolas Carter is a world-class performer on Paraguayan harp, He has performed in dozens of countries around the world, including Africa (Guinea-Bissau). An outstanding performer and teacher, he connects easily with audiences of any size, age, or condition. He is a US citizen raised from early childhood in Paraguay, 100% bilingual in Spanish and English. He is very widely known among folk harpists in the US, from presentations in workshops at such places as Somerset Harp Festival and Southeastern Harp Weekend. He deserves and has earned greater attention in a diverse and wider world of concert performance. He has been a repeat performer for events sponsored by John Kovac and by Harping for Harmony Foundation in Front Royal, VA and in Morgantown, WV.